Joseph L. Silsbee designed this house for John F. Palmer, inventor of the pneumatic tube and cord tire. Silsbee also designed the Lincoln Park Conservatory, and employed Frank Lloyd Wright as an apprentice architect. The three-story residence has elements of Victorian, Tudor and Shingle styles and combines shingles, wood and half-timber, and decorative copper ridges. The family room addition features an Arts & Crafts hearth constructed from the same bricks as the chimney. This elegant home represents a transition from the more ornate and elaborate Victorian style to the simpler bungalow and prairie styles of the early 20th Century. The reception area of the interior has undergone an extensive restoration and received the Olmsted Society’s Restoration Award in 2006. 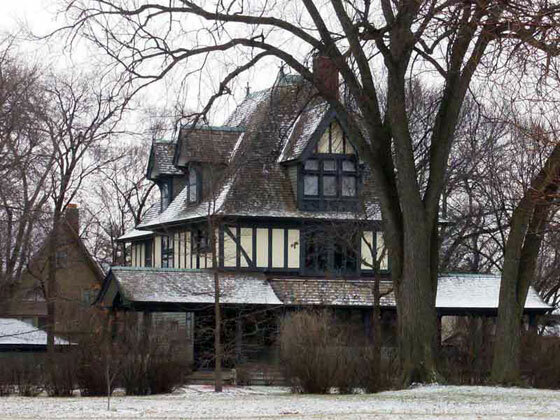 The house is on the Illinois Historic Structures Survey and has local landmark status.